Prior to 2001 the sampling of postal votes in elections was of little value to candidates and their agents because the number of postal votes was low and the envelopes were opened only shortly before the count, giving them little information and little time in which to use it. Prior to 2001 voters had to state a reason for applying for a postal vote or to obtain attestation of illness from a doctor. In February 2001 it became possible for anyone to get a postal vote on demand in Great Britain. 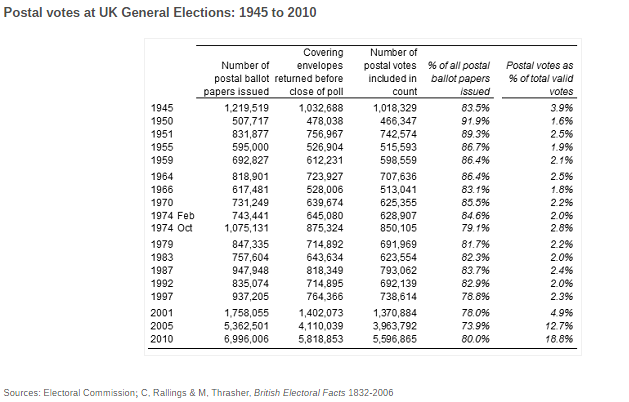 This led to a massive rise in the proportion of votes in the UK General Elections from 2.3% in 1997 to 18.8% in 2010. 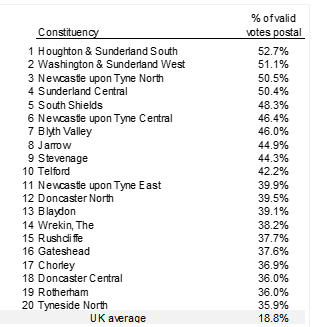 The rise in postal voting has not been equally spread, with eight of the top ten constituencies for postal voting in the 2010 General Election being in the North East of England. The popularity of postal voting in the North East may be a residual effect of the November 2004 Regional Referendum in which which all votes were cast by post. With over fifty percent of voters in Houghton & Sunderland South voting by post, if candidates could have sampled from those postal votes ahead of the count they would have been able to make confident predictions of the final result, but even sampling from the national average of nearly 19% postal votes would give agents valuable information on how their campaigns were going. The work required to open postal votes in the Referendum was also increased by the decision of the Chief Counting Officer to verify the identity statements of 100% of postal votes rather than the 20% required by the legislation. This thorough checking of identity information reduced the risk of fraudulent postal votes but increased the workload in postal vote openings. The workload caused by the high number of postal ballots coming in and the need to verify all signatures created pressure to start the opening of postal ballot envelopes as soon as postal ballots started coming in. In Glasgow the opening of postal ballots was started on Tuesday 9 September and continued everyday from then to polling day. I am waiting on responses from other councils to Freedom of Information requests for the timings of their opening of postal ballots, but if Glasgow’s timetable is typical, then the campaigns would have been getting data on the breakdown of postal votes from 9th September. This fits with McTernan’s admission of 14th September that Better Together had information on postal votes. ‹ Why was the Electoral Commission report so uncritical of the conduct of the Referendum?